Indian Prime Minister Narendra Modi’s recent statement on Balochistan has sparked furious protests across the province with Chief Minister Sanaullah Zehri accusing New Delhi of stoking terrorism in the volatile region. 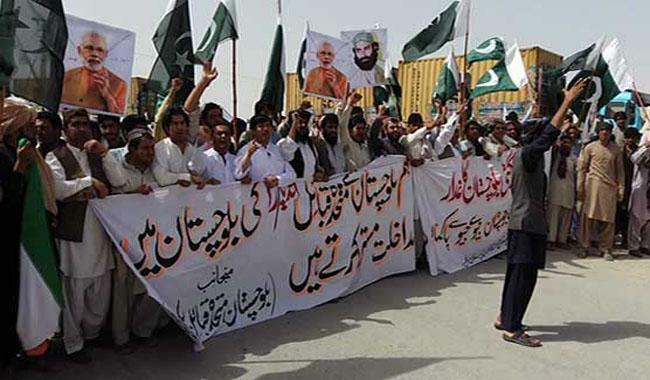 On Thursday, civil society activists and different political organisations staged rallies in Dera Bugti, Lasbela, Naushki, Chaghai, Khuzdar, Naseerabad, Jaffarabad, Kohlu, Dera Allahyar, Dadhar, Sibi and Bolan among other cities of Balochistan. The protesters marched through the streets, condemning the Indian premier’s Independence Day diatribe against Pakistan, in which he claimed that the people of Balochistan and Azad Kashmir had thanked him for talking about them. In Quetta, the Pakistan Workers Party workers took out a procession and marched through different roads before ending the protest in front of the Quetta Press Club. The protesters also set fire to Indian flags to express their anger and shouted slogans against the Indian prime minister while demanding the federal government take up the issue on international forums. Balochistan CM Zehri said the demonstrations and rallies were evidence that Balochistan’s people did not like whatever Modi had said about the province. Zehri said the Kashmir and Balochistan issues were entirely different as people of his province were in favour of Pakistan while people in Kashmir were resisting state-sponsored oppression. He also castigated Brahamdagh Bugti, the self-exiled head of the banned Baloch Republican Party (BRP), for thanking Modi for taking up the issue of Balochistan. “Thousands of people resort to protest in Kashmir, but here, Brahamdagh or anyone who supports Indian intervention, cannot manage to assemble 50 people,” he added. The CM said he had pointed out India’s support to terrorists in Balochistan earlier but no one had paid attention back then. The home minister, he said, had publicly announced the arrest of four terrorists who had confessed the Indian government was providing them financial assistance. Meanwhile, Home Minister Sarfaraz Bugti said the people of Balochistan had given a clear message to the Indian prime minister that he should think before making any statements about them. While addressing a conference at Quetta Law College, he also seconded Zehri that India was behind the unrest in Balochistan. The home minister said the politics of Brahamdagh was restricted to Facebook and he did not enjoy any support in Balochistan. “Brahamdagh has lost support even in Dera Bugti as the people took to the streets to condemn the statement of Modi,” he said. Published in The Express Tribune, August 19th, 2016. In the modern times, to carry out an organized religio-ethnic cleansing and then to get away despite the present day media watching every event is indeed a great feat by any Goebellian standards. Keeping aside the question as to who was the prime mover of the Gujarat pogrom, the recent pronouncements of the special courts trying the major cases of violence like Gulberg Society, Naroda Patiya, Best Bakery, Sardarpura etc would undisputedly establish that the violence was lead by the saffron brotherhood. In the Naroda Patiya case, even the minister of Modi’s Government Mayaben Kodnani and the VHP leading activist like Babu Bajrangi etc have been convicted. Yet despite these and many other irrefutable evidence, the concerted effort by the rioters to paint the violence as a spontaneous reaction of the angry Hindu masses to the “barbaric” attack of the Muslims killing 59 Hindus in Godhra has found many takers and paid handsome dividends to BJP which presided over the violence. The perception of the common man to willy-nilly accept the action-reaction theory was primarily because of the voluminous propaganda material that the rioters threw at the common man without any effective counter by the other political establishments in the country. We have tried to research the mode and manner adopted by the saffron brotherhood to dominate the cyberspace, and to our shock and surprise, we discovered that Narendra Modi through his closest aides has created a network of websites to disseminate propaganda on variety of topics and subjects. India272.com, GujaratRiots.com, NitiCentral.com, BJPOne.com etc – All these websites are being run by Rajesh Jain’s team who is officially appointed by Narendra Modi to run his IT campaign. Their common roots can be seen from the fact that each one of these websites reside on the same server with the IP Address 206.183.107.25. Rajesh Jain’s blog Emergic.Org is also one of these several sites sitting on this server. India272.com which is regularly endorsed by Narendra Modi on twitter also sits on this same server. Having shown the above network of sites created under aegis of Modi, one of the websites which is immensely note-worthy for its distortion of facts is the GujaratRiots.comwebsite. The choice of the name itself is very diablolic since any netizen who searches for information on gujarat riots is likely to use phrases which includes the words “gujarat” and “riots”. As a result all the cursory searches will end up with visits to GujaratRiots.com site since it features very high in Google’s search results. Thus by an ingenious choice of name, the saffron brotherhood gets a netizen into their website and is fed with false and distorted information. A example of one such distortion is an attempt by the GujaratRiots site to justify the complete inaction of Gujarat Police on 28th February 2002 when the mobs went on rampage in the area of Naroda and Gulbarg Society. The site states that as on the second day of the riots, i.e. March 1st 2002, when even the army could not control the situation in Ahmedabad, how could the police control it on 28th Feb1. How fallacious this argument is can be seen from the fact that both Naroda Patiya and Gulbarg Society are within a radius of 2 kms and come under a single police zone number 4 headed by DCP Gondia IPS. The said zone also comes under the Sector 2 of Ahmedabad police led by then Additional Commissioner of Police – Shri MK Tandon. Both these IPS officers Gondia and MK Tandon were accompanied by large contingents of Armed Policemen along with Special Task Force with modern weaponry. Besides them, those areas are also covered by the local police led by the respective police inspectors of each area namely Naroda and Gulbarg (KG Erda). From the deposition of KG Erda in Nanavati Commission, the police inspector of the Gulbarg area it is clearly seen that since 12:00 noon on 28th February, the crowd had swelled from 10,000 to 20,000 around 2:45 p.m and had surrounded the Gulberg society. (On 28.02.2002) Till 12.15 pm a mob of around ten thousand people had already collected.When I again reached Gulbarg society at 2 pm there were twenty thousand people and at that time there were a total of sixteen police menâ€¦it is true that at 2.45 pm I had sent a message to the control room that a mob of ten thousand people had set fire in the area of Gulbarg society and surrounded it and that police has also been surrounded and requested for the SRP force to be sent. At that time me and other six constables had got encircled by the mob and smoke was coming out from the houses in Gulbarg society. During this period Erda had desparately sought for police reinforcement to disperse the mob and had made several phone calls to the Police Control room as well as Mr Gondia and Mr Tandon. The phone calls shown in the images below were obtained from the phone call data submitted in Nanavati Commission. The first image shows the desperate phone calls of KG Erda to the Police Control Room asking for police Â reinforcement. The second image are the phone calls between Erda and DCP Gondia/Joint Commissioner Tandon. While on one hand a massive crowd was surrounding the Gulberg Society making Erda desperately ask for police reinforcements, on the other the hand the analysis of the locations of Joint Commissioner Tandon establish that he along with his task force had come to the Naroda/Gulbarg area around 12 noon and had hurriedly gone away with his task force to a distant area called Revdi Bazar and hung around there Â till 4 p.m.Â despite there being no major rioting in those areas. Â By the time MK Tandon went back to Gulbarg Society at 4 p.m, the mob had already burnt down the entire society along with 64 men, women and children including Ehsan Jaffrey with only Erda and his few policemen being silent spectators to the whole massacre. Similarly DCP Gondia reaches Gulbarg only at 4 p.m. when the society had been already burnt down. This clearly shows how Police along with their task force moved away from areas of rioting. It can therefore be seen as how Narendra Modi through GujaratRiots is trying to mislead the nation by providing distorted account of Police Action and much more. Truth Of Gujarat therefore finds it necessary to go into details to disabuse the wrong perception being created by the saffron brotherhood to justify violence that was nothing but an organized pogrom against the Muslims. We will deal with the other ‘myths’ being circulated by GujaratRiots.com site and demystify them in the coming days. India272.com promptly changed its IP Address from 206.183.107.25 to180.149.244.132 after our exposure. You can see that the change was detected on 06 Oct 17:38 GMT i.e 11:08 p.m. IST. We published the post at 8:08 p.m. IST. Is Modi feeling shy now? Dr. Sadia Ali has timed her article titled “The poor daughter of Baluchistan” in The News dated August 17, 2016 with Narendra Modi’s diatribe on the occasion of India’s Independence Day on August 15. She has lent strength to Indian ongoing propaganda onslaught drumming up the sufferings of the people of Baluchistan who in their view are oppressed and given a raw deal by Baluchistan and Federal Governments. Dr. Sadia is a women’s rights activist and she works in Baluchistan. She has presented a depressing picture of Maternal Mortality Ratio (MMR), child mortality, literacy rate, poverty and healthcare, asserting these are near absent in resource rich Baluchistan. She says that 83.4% children in the province suffer from malnourishment. She says the entire generation in Dera Bugti and in Baluchistan cannot afford a proper meal. This article might have been read with interest in normal times since the theme of our writers has all along revolved around socio-economic grievances of people of Baluchistan, some being genuine and others self-perceived. Contents of Sadia’s article tend to validate the pronouncements of Modi and Indian propagandists duly reinforced by Pak media, NGOs and human rights activists on Baluchistan. This coincidence has certainly raised eyebrows about her hidden motive, whether she has written it to earn kudos from the people of Baluchistan for highlighting the miserable plight of the women, or to strengthen the case of India and please Modi. To make her story appear more appealing, she names the female patients who have suffered on account of lack of medical facilities while delivering a child. Why can’t Sadia hear the shrieks of Kashmiri women gang raped in thousands, feel the pain of young widows, cries of half-widows who do not know whether their missing husbands are dead or alive, the anguish of mothers in whose arms their sons riddled with bullets breathe their last, sighs of grief stricken orphans and systematic elimination of the youth in fake encounters. I wish she had the moral courage to write an article on the suffering of Kashmiris at the hands of pitiless Indian security forces, devoid of basic rights and social facilities and the way the children are being killed or blinded with rubber pellets. There is curfew, complete media blackout, mobile services clamped and human rights activists disallowed to enter Indian Occupied Kashmir (IOK) since July 8. This is the 3rd generation of Kashmiris wading through blood filled streets in IOK. I am sure Sadia must have seen countless pictures of the injured victims whose faces and bodies are pock marked with pellets and well over 100 have lost their eyesight or are fast losing it. Tragically, India has rejected Pakistan’s offer to treat the injured since India doesn’t have facility to treat pellet wounds. While India keep parroting that IOK is integral part of India, it has deployed 7, 50000 security forces equipped with special powers to keep it integral by use of brute force. Volcanic eruption of protest movement in IOK in the aftermath of brutal killing of freedom fighter Burhan Wani on July 8, and wholehearted love expressed by Kashmiris for Pakistan has dumbfounded Indian leaders. Pakistan’s principled moral, political and diplomatic support to the Kashmiris in distress has peeved them. Curt reply of Ch Nisar to visiting Indian Home Minister Jagnath Singh, expounding that Wani was a freedom fighter and not a terrorist, that resistance movement in IOK is a freedom movement and not terrorism, and that Kashmir issue is disputed and must be resolved in accordance with UN resolutions, further miffed them. As the world began to take notice of gross human rights violation in IOK and Indian deception to hide their crimes didn’t work, Modi lost his sense of balance. He stated that people of Baluchistan, Gilgit-Baltistan (GB) and Azad Jammu & Kashmir (AJK) had thanked him a lot in the last few days for “raising issue of atrocities against them, and it has given me great joy”. This was a skewwhiff response to the affectionate outpouring of the Kashmiris for Pakistan in the face of guns and bayonets and their hatred for India as was once again amply demonstrated on the occasions of Pakistan and India’s independence days on August 14 and 15 respectively. While former was celebrated with fervor, the latter was observed as black day in IOK. In his exuberance, Modi let the cat out of the bag and further reinforced Pakistan’s claim that India’s RAW is fully involved in Baluchistan and is also behind Balwaristan movement in GB and is now trying to penetrate AJK where recently all political parties took part in fair and free elections and PML-N won comprehensively, and which acts as the base camp for freedom movement in IOK. Modi must not forget that large scale separatist movements in 14 States of India, of which the Naxalite movement, Kashmiri movement and Khalistan movement are the most dangerous, expectantly look toward outside help to rid them from the yoke of India. Hindu Dalits, treated as Maleechas (untouchables) by the Brahmans have also for the first time picked up courage to protest against inhuman treatment meted out to them. Modi has come under severe criticism within India for his senseless prank which has damaged India’s stance on IOK as its integral part. This is the second time he has committed a blunder. Earlier on, he had made a confession in Dhaka last year that India had played a key role in liberating Bangladesh in 1971 by fully supporting the Mukti Bahini and that like many Indian soldiers, he had also physically participated in the insurgency. Pakistan has already provided tons of proofs of RAW’s subversive activities in the three conflict zones inflamed by foreign agencies to the UN. Arrest of Indian serving Naval Commander Kalbhushan Yadav in Baluchistan last March and his startling revelations that he had been operating RAW network from his base in Chahbahar since 2003 to destabilize Baluchistan and Karachi has left no doubt about RAW’s deep rooted involvement. RAW has been making use of the soils of Afghanistan and Iran to indulge in proxy war in Pakistan and utilizing its proxies in the form of TTP in northwest Pakistan, BLA, BRA and BLF in Baluchistan and MQM in Karachi. India complements its covert operations with propaganda war and psychological operations to undermine and discredit Pakistan. With regard to Baluchistan, aim of Indian propagandists is to not only equate Baluchistan insurgency with Kashmir freedom movement, but also to portray former as freedom movement launched by the Baloch against oppression and deprivation of their rights, and the latter as terrorism. A willful campaign was launched to discredit the Frontier Corps by blaming them for missing persons, mutilated bodies and mass graveyards. Pak security forces fighting the foreign paid terrorists in Baluchistan are projected as ‘repressive occupation Army’. Destabilised Baluchistan helps in scuttling Iran-Pakistan gas pipeline project and Gwadar seaport. There is no comparison between the two since Baluchistan is integral part of Pakistan and is open to all. About a dozen of rebellious Baloch leaders are stationed abroad and are puppets in the hands of host countries. They are highly unpopular in Baluchistan and cannot face their respective tribes since they have sought the intervention of India, US and UN to make Baluchistan independent. Great majority of people of Baluchistan including the Baloch are highly patriotic, they love Pakistan, Army and paramilitary forces, and have full confidence in the provincial government. Conversely, Kashmir is an unfinished agenda of Partition, it is jugular vein of Pakistan, and is under illegal occupation of India since October 1947 and the dispute is awaiting resolution by the UN since 1948. IOK is barricaded and has been turned into an open prison, where no outsider or investigating team is allowed to enter. Right of self-determination has been given to the Kashmiris by the UN but denied by India. The entire political leadership of Kashmiris is based in Kashmir and they love Pakistan. I will not disagree with Sadia that Baluchistan is way behind other provinces in terms of development and education, and that successive governments didn’t pay desired attention to remove its genuine complaints. But none can deny that the Baloch Sardars who have been in the driving seat took little interest since they are anti-development. They remained more immersed in retaining perverse Sardari system by converting 90% of territory into B Area where the police has no writ, and only 10% as A Area. They have been misruling the province, mostly engaged in inter-tribal rivalry, pocketing development funds to enrich their coffers and denying education to keep the people illiterate and enslaved. Incidence of women buried alive and fed to dogs have occurred. With regard to Dera Bugti, why does Sadia feel shy of mentioning the historical facts as to what the so-called popular leader Nawab Akbar Bugti had done for his home town? Was he not a tyrant and an exploiter? Was he not maintaining an armed militia and private jails and had he not expelled the whole lot of Kalpar and Masouri tribes from Dera Nawab and now the two tribes have been fully resettled and rehabilitated? Were the people of this area better off then or now? Sadia must not forget that while great majority of Baloch are patriotic and love Pakistan, a small disgruntled segment in Baluchistan is prone to rebellion and has been picking up arms against the state to gain independence since 1948. These misled Baloch rebels have always been provided safe haven and support by Afghanistan, former Soviet Union and India. This trend is still continuing and needs elimination. When Gen Musharraf tried to remove the inequities of Baluchistan by way of launching mega projects including Gwadar port and construction of road infrastructure in the interior, improving education and healthcare, the Sardars of Bugti, Marri and Mengal tribes ganged up and at the behest of foreign powers started an insurgency in 2004 which later on turned into a separatist movement. Development of Gwadar port by China was unacceptable to USA and India and hence the insurgency was stoked to scare away the Chinese. Despite the insurgency, development works in Baluchistan continued and the current nationalist government backed by federal government is making sincere efforts to defeat foreign abetted terrorism and improve the education and socio-economic conditions of the province. Back of the separatist movement has been broken and hundreds of rebels have come down from the hills and have surrendered arms. Completion of dozens of dams, Gwadar port, opening up technical and cadet schools/colleges and CPEC will surely change the complexion of Baluchistan. However, Sadia says that Baluchistan is constantly sliding down in all human development indicators. She measures its development from the yardstick of MMR only and compares it with war torn Somalia and Liberia. She conveniently overlooks India, which prompted her to write this article, endowed with worst human development indicators including MMR but keeps harping that India is shining. Sadia and her ilk never talk of weak areas of India but leave no stone unturned to glorify it and shame Pakistan. This sort of article which adds fuel to the injured feelings of dissatisfied segment in Baluchistan helps India and others in their propaganda war. Can anyone in India dare write such an article highlighting pathetic conditions of minorities in India? Sadia laments the lavish arrangements made on the occasion of Independence Day celebrations in Baluchistan and gives a sad touch to it saying that music, and the noise (Pakistan Zindabad chants) was so loud that it muffled the cries and anguish of the women in labor pain. She tantalizingly repeats “resource rich Baluchistan”, but doesn’t mention that foreign powers eying at these resources have led the handful of greedy Sardars up the garden path that resources will be theirs. Their eyes have not opened even after seeing the plunder of mineral resources of Iraq and Libya. After passage of 18th Amendment and grant of provincial autonomy to the provinces, the oft repeated allegation of exploitation by the Centre or Punjab is no more applicable. Sadia go the extent of saying that socio-economic indictors of war torn Afghanistan are better than Pakistan. She and her well-read types are the ones who fan misgivings, frustration, despair and hatred among the people of smaller provinces. The so-called intellectuals and secular writers at the behest of RAW had played a big role in feeding fictitious statistics, in making false comparisons between the two wings of Pakistan and in inciting hatred among the Bengalis against West Pakistanis. Even now, there are quite a few toadies of India in Pakistan ever ready to sell their souls for money and to augment Indian propaganda against Pakistan and to cover the crimes of India in IOK and several parts of India and to glorify the cause of separatists in Baluchistan. One example of this is Hamid Mir’s TV program on Geo soon after Modi’s rants. He posed a question to the guest speakers whether the Baloch insurgents were terrorists or freedom fighters. It is now a well-established fact that Baluchistan is a target and Indo-US-Afghan-US nexus has been conjointly working since 2002 to destabilize, secularize, denuclearize and balkanize Pakistan. Map of Balkanized Pakistan published by US/western think tanks and Lt Col Ralph Peters indicated Baluchistan and Pushtunistan as separate states. India has targeted Baluchistan so as to use it as a card to checkmate Pakistan in Kashmir. Indian defence minister had stated last year that in case Pakistan doesn’t lay its hands off IOK, it should be prepared to lose Baluchistan. He has now termed Pakistan as hell and accused it of violating human rights violations in Baluchistan. The fact is that the wale of Kashmir popularly known as paradise on earth has virtually been turned into hell. 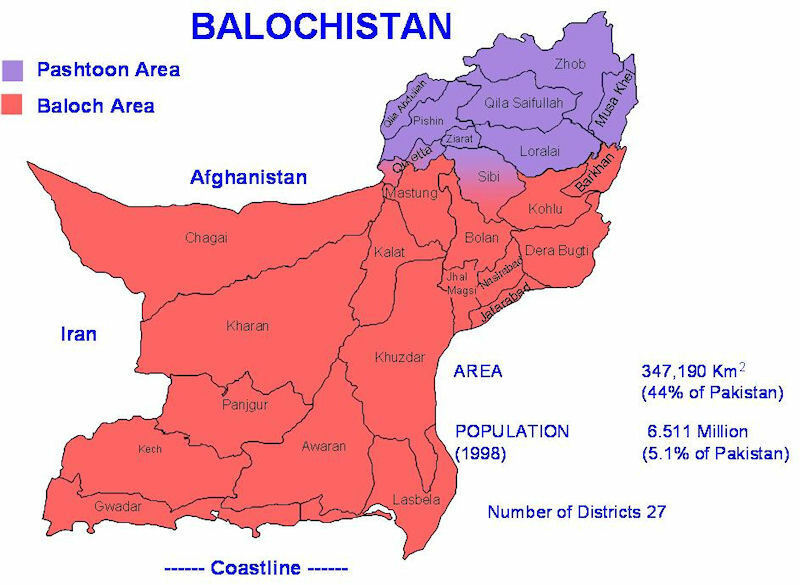 If Baluchistan suffers from inequalities, which part of Pakistan doesn’t? Is whole of Punjab prosperous? May I ask learned Sadia as to which country in the world is free of inequities and which country has equally developed states/provinces? In USA, 99% people are poor and only 1% are dirty rich. 22 States of the US want to go their way because of socio-economic grievances and wrong policies of the state. In India, 37 insurgencies are raging in different parts of the country and there are separatist movements in 14 states, all suffering from injustices and socio-economic deprivations and fed up of four-fold caste system. After his previous flopped campaigns to oust and dislodge the PMNL government in 2013 and 2014, Imran Khan has announced to stage renewed multi- pronged agitation to knock down Nawaz Sharif particularly and his government generally. Tahirul Qadri and Sheikh Rashid have also announced to join the fray against Nawaz Sharif on the issue of Panama leaks wherein the names of Nawaz Sharif’s children are mentioned for maintaining offshore accounts by sending money from Pakistan. Imran Khan have also announced to stage sit ins long marches and hold public rallies. He has given September 3 as the deadline for government’s response. Thereafter he would go for countrywide agitation and protests. Already Imran Khan’s Pakistan Tehrik-e-Insaf party and Sheikh Rashid ‘s Awami Muslim League have submitted their petitions to the speaker of the national assembly for disqualification of Nawaz Sharif. Simultaneously they intend to file petitions in the supreme court of Pakistan for money laundering against their arch target the prime minister of Pakistan main Nawaz Sharif. Jamaat-e- Islami has too joined the fray and its leaders have also announced to approach the supreme court to probe money laundering and offshore accounts of Nawaz Sharif and his family members who are primarily two sons and one daughter. Simultaneously Jama-i-Islami, Tahirul Qadri the chief of Pakistan Awami Tehrik and sheikh Rashid president of Awami Muslim league have decided to mount street protests along with the legal battles against Nawaz Sharif primarily for stashing money abroad. Although the issue of corruption is important but to single out the prime minister seems to be motivated with a kind of political animus. If the supreme court of Pakistan is approached to hand out their verdict on the money laundering case, then Imran Khan and other litigants instead of mobilizing street agitations, should wait for the verdict. If the apex court finds truth in the allegations, then prime minister had no moral grounds to hold on to his office. But if not then he should continue to administer his responsibly and complete his term till the next general elections to be coming off in 1918. The renewed round of agitations and long marches that all the fringe political parties and religious zealot Tahirul Qadri aim at kicking off against the PMNL government, would plunge the country into a spell of chaos that one witnessed during the upheavals of 2102, 2103 and 2014 whipped up first by Tahirul Qadri and later joined by Imran Khan along with Sheikh Rashid. Although presently it is not the elections season in Pakistan, nor Imran Khan is a candidate, he can be equated with Donald Trump, the Republican Party nominee for his mercurial temperament, odd antics, outlandish statements and emotional decisions. Mr. Khan’s attitude in politics is irrational and immature. He should have been convinced that his earlier boycotts and fierce rabble rousing had not been successful in dislodging his prime foe Nawaz Sharif. How can his latter day anti-government agitation fructify when PMNL’s political standing has become much credible after its victories in Azad Kashmir elections and even on odd seats in Pakistan? I would wish if better sense prevails on firebrand Imran Khan and he creates a favorable public opinion in his favor by presenting his agenda, plans policies in a decent and peaceful manner. That would be more convincing and result-oriented that knocking down the political edifice based upon the peoples ‘mandate. The next general elections are far by two years and in this period Imran and his party cohorts can adopt a positive and constructive strategy to win the majority votes and thus be justified to hold the reins of the government. If the ongoing democratic set up no matter how faulty, is short-circuited, then this could lead to unhealthy tradition to oust a rival government by agitations and Dharna and by inciting the vulnerable sections of society. It defies the logic why Tahirul Qadri who spends better part of the year in Canada comes to Pakistan to sabotage a democratic and political system that is the best notwithstanding whether the power wielders were competent or inept and corrupt. The best and the logical recipe to oust a political establishment should be on the political turf and not by noncooperation movements and violent tactics. Let the decision to elect the MNAs should be left to the choice of the people and not by short-circuiting it by foul and aggressive means. The chaos that would boil up with such a rowdy rivalry could pave way for the army to step in and thus the country would recede back to dictatorship. A worst democracy is better than a best dictatorship. The periods of dictatorships are like oasis in a desert but not a full-fledged ever green orchard which in the case of power politics is democracy. Imran and other parties should not disregard and forsake the democracy at any cost for personal whims and wait for the elections to be held when due. As far Panama Leaks and money laundering of Nawaz Sharif, let the supreme court of Pakistan hand out a verdict that should be binding on all. It would be in order that along with the probing of money laundering case and overseas accounts of Nawaz family and all other such cases should be looked into by the supreme court or NAB for that matter. This probe should be across the board without any political vendetta for political gains. Even if Imran Khan succeeds in removing Nawaz as the prime minister he may later also remain vulnerable for a similar backlash from his detractors. So in this vicious musical chairs game of vendettas, should we infer that he is taking a wrong course for a just cause. Or else he may be acting at the behest of some foreign actors who don’t want CPEC (China Pakistan Economic Corridor) to fructify or Pakistan to remain politically and economically stable. I might be mistaken but there seems to be a great deal of similarity in the temperament, attitudes, outlook and world view of Donald Trump and Imran Khan. Both are short of vision, depth and sobriety that are the hallmarks of a politician and national leader. Both are readily pleased and infuriated alternately. They would look angels when in sober and kind mood. On the contrary when they are angry they would be provoked beyond permissible limits. On the whole both politically are incorrect and swayed by emotions and resort to knee jerk reactions to challenging situations. Instead of healthy dialogue and logical response both are in the habit of lambasting and undermining their detractors, rivals and critics with condemnations, curses and derogatory remarks. Both tend to suffer from illusion of self-glorification and popularity. Both offer plans and recipes for nation building and politico-socio and economic issues that visibly look enticing but practically undeliverable. Both tend to suffer from distortions of understanding by making non-issues as big issues. Both are emotionally zealous about their policies and imbibe bubbling spirit to excel other politicians in serving their respective nations. As such one may infer that Imran Khan is the Donald Trump of Pakistan. The only difference between these two leaders and their postures that I can perceive is, that while Donald uses his party’s platforms and political caucuses to unfurl his agenda, Imran tends to advance his political bandwagon by demonstrating street power, holding rallies, sit ins and long marches that are reminiscent of the Indians demanding liberation from the British colonial rule in India.